“You look at the European Union and it’s Germany. 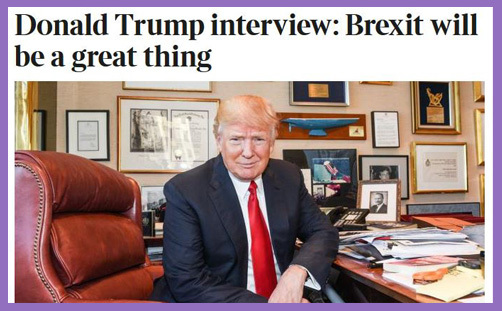 Basically a vehicle for Germany,” says Donald Trump in Michael Gove’s scoop interview for The Times. It comes as a cyclone of fresh air: never in the post-war history of European unification has the President of the United States been opposed to Le Projet. It is well documented that the (pro-EEC) European Movement was financed and facilitated by the CIA (see Controversies from Brussels and Closer to Home, [Lee Rotherham, 2011]), yet now, the President-Elect of the United States is not only traversing CIA received wisdom (via Twitter), he is proclaiming that Brexit will be great for Britain, and, further, he prophesies the eventual break-up of the whole political union: “People, countries, want their own identity and the UK wanted its own identity,” he observes. And he’s not wrong. Gove’s interview contains tasty morsels and nuggets and wotsits galore. Most of the MSM is running with the “Brexit great for Britain” line. A few are focusing on Angela Merkel’s “one very catastrophic mistake” of opening Germany’s (and so EU-Schengen) borders to an unlimited number of Syrian refugees (which Trump terms ‘illegals’, for some reason, which is odd because i] the vast majority were refugees; and ii] an invitation to immigrate manifestly makes them ‘legals’). This paragraph is naturally being adduced in some quarters as further evidence of Trump’s ‘racism’. But by far the most interesting geo-political comment he makes is in calling a Teutonic spade ein spaten. Margaret Thatcher certainly knew about Franco-German dominance. She commented at the Fontainebleau Summit of 1984: “The whole axis is France and Germany, and what they say the others agree with” (not in the FCO version [see: ‘The memoir as history‘]). Considering the economic dominance of Germany and the relative weakness of France, it is difficult to argue against Trump’s proposition that the EU is “basically a vehicle for Germany” – economically, if not politically, culturally and spiritually. The European Union is essentially the recreation of the old Empire of Charlemagne. This is not the place to expound an academic thesis (see, for example, The Holy Roman Empire: A Thousand Years of Europe’s History [Peter H Wilson, 2016]), but from the moment the Treaty of Paris was signed in 1951, the European Coal and Steel Community (ECSC) bound together the economic and political destinies of France and Germany, and this had echoes of a bygone European age. Charlemagne was crowned Imperator Romanorum (Emperor of the Romans) by Pope Leo III in AD800. He became Western Europe’s ‘Christian’ Caesar – a Roman emperor born of a Germanic race. The West once again had an emperor, and his coronation was to become the central event of the Middle Ages. He was proclaimed Rex Pater Europae (King Father of Europe) and espoused the ideal of a unified Christian Empire of the Frankish and Germanic tribes – albeit christianised at sword-point – in close alliance with the Pope. In 962, Otto the Great revived Charlemagne’s Empire as the first German Reich, and was crowned Holy Roman Emperor by Pope John XII. This Reich became known as the Sacrum Romanum Imperium Nationis Germanicae (Holy Roman Empire of the German Nation). Germany became the power centre of the Empire. Throughout the Middle Ages it was to be the kings of the Germans, crowned by the Pope, who would be named Holy Roman Emperor. Napoleon crowned himself with the ‘iron crown’ of Lombardy, the great historic symbol of Europe which had previously been worn by Charlemagne, Otto the Great and other European sovereigns. And so the spirit of Charlemagne still broods: the Franco-German axis has chewed and spat out Greece, the birthplace of democracy. ‘Ever closer union’ has alienated and lost the British. And there is still more to come: as Donald Trump prophesies, others will secede, for why should the proud nations and peoples of Portugal, Italy or Spain wait patiently for and be coerced to appreciate “the powerfully federalist character of this project”? The peoples and countries of Europe want their own identities; the restoration of national sovereignty to forge their own destinies. A European political and economic union dominated by Germany is neither an assurance of prosperity nor a guarantee of peace. It has taken 70 years for a US president to understand and appreciate this.